Rejoice. Rejoice. Applegarth Reopened after Unbelievable19-year Battle! A medieval highway in North Yorkshire is to be reopened for horse riders and cyclists after a 19-year battle against stiles obstructing the route. This route has been promoted as a Classic Coast to Coast mountain bike route since 1994 - as per the sign by this stile..
A public bridleway almost four miles long, linking Clapgate Bank, near Marske, and Richmond, has been obstructed by stone stiles near the hamlet of Applegarth for as long as anyone can remember. On the face of it, these stiles suggest that the track was wrongly recorded as a bridleway when the definitive map of public rights of way was first surveyed, back in 1952, and that the correct status is just public footpath. Indeed, the track is part of A A Wainwright's famous 'Coast to Coast' walking route. But local horse riders and mountain bikers did not accept that the stiles were 'ancient', and almost twenty years ago started complaining to North Yorkshire County Council, asking for their replacement by gates, while continuing to use the route, finding ways around the blockages as best they could. After years of complaints, investigations, and reports to committees, North Yorkshire County Council decided not to open-up the route, but instead to make an order downgrading most of it to a public footpath. The Byways & Bridleways Trust objected to this order, as did the British Horse Society and the Swaledale Outdoor Club, and other local people. On 2 March 2010 the issue was argued out at a public inquiry, with the Byways & Bridleways Trust's Robert Halstead and Catriona Cook leading for the opponents of the closure. When the bridleway was first surveyed for the definitive map, in 1952, both surveyors regarded it as a through route from Swaledale and Marske to Richmond, and one described it as "an ancient highway from Richmond to Marske." There was a lot of documentary evidence of the route being used by packhorse traffic, but Catriona Cook's researches had found the crucial item: a short record from an Assize in 1304 stating, "Thomas de Applegarth and Isbell his wife obstructed a certain road in West Applegarth ... leading from the town of Richmond to the pasture in Marske and beyond into Swaledale, in which plaintiffs had right of way for horses and carts [etc]." This was sufficient to persuade the Secretary of State's Inspector, Mr Barney Grimshaw, that no mistake had been made back in 1952, and that the recorded status of bridleway should not be overturned. Mr Grimshaw issued his decision letter to this effect on 7 April. 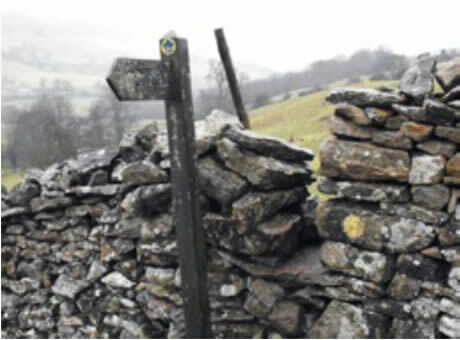 The Byways & Bridleways Trust welcomes this decision and is looking forward to North Yorkshire County Council getting the stiles replaced by gates in the near future so that the public on horseback and on pedal cycles, and walkers who can manage gates, but not difficult stiles, can once again enjoy this ancient highway.